This is Part III in our five-part series on Madang Governor, Peter Yama. See Part I and Part II. On 5 December 2000, things were looking up for Peter Yama. He had just obtained two default judgments on liability in cases alleging breach of contract by the State telecommunications company, Telikom Limited. Yama was claiming a total of K10,641,266.62, through Yama Security Services and Ace Guard Dog Security Services Ltd. The quantum of damages were to be assessed later. A darker picture emerged though after a successful appeal to the Supreme Court by Telikom Limited. Yama the Supreme Court concluded had abused legal process in an effort to win a K10.5 million pay day – while a later National Court decision accused Yama of forgery. The Supreme Court appeal exposed details of how the default judgments were obtained against Telekom Limited. Telekom, it appears, was denied reasonable time to file its defences – defences that included allegations of ‘fraud, conspiracy to defraud and illegality of contract’ against Peter Yama’s companies. The Supreme Court found that the original applications for default judgments filed by Peter Yama’s lawyers, had significant procedural problems and should have been found ‘incompetent’ and ‘struck out’. The December 2000 defaults judgments were not the first attempt by Peter Yama to expeditiously obtain a ruling on liability. Previously on 21 September, the court refused to enter default judgments over an alleged failure by Telikom to file a verified defence, ruling the application was premature. The court found Yama’s lawyers had failed to ‘properly request’ from Telikom particulars of its defence. In response, on 24 October Yama’s lawyer – Poro Lawyers – requested that Telikom provide the document within 7 days. This was an unusually short period of time ‘unilaterally fixed’ by the Poro Lawyers, according to the Supreme Court. Poro Lawyers was also criticized over their failure to consult with Telikom’s lawyers or seek directions from the court. Exacerbating matters, the request was served in Port Moresby, while Telikom’s lawyer was based in Mount Hagen. Finally, Yama’s lawyer allegedly did not even wait for the expiry of the 7 days before filing an affidavit supporting a new claim for default judgment, on the grounds that the defence documents were not lodged in time. Despite the hurdles faced, Telikom did file its detailed defence documents before the application for default judgement was heard, but outside the arbitrary 7 day deadline set by Yama’s lawyer, a period the Supreme Court found ‘clearly insufficient and therefore unreasonable’. The Supreme Court noted the 30 page defence filed by Telikom Limitd was ‘lengthy, extensive and comprehensive and raised substantive issues including fraud, conspiracy to defraud and illegality of contract,’ along with ‘other allegations of foul play that allegedly occurred in the tendering process involving the security contract’. The level of detail and the seriousness of the claims made in the defence document did not stop Yama’s lawyers from arguing that not only should the defence be rejected for being filed outside the arbitrary deadline, but that it lacked substance. This argument was initially accepted by the judge who issued the default judgement: ‘I consider it [the defence] needed more than telltales and suspicions’, he said. Wrongly exercised his discretion to summarily dismiss the substantive defences raised in the Defence without a trial on merits. The Defences were clearly arguable and deserved to go to trial. The trial judge erred in not determining the reasonableness of the 7 day time limit unilaterally fixed by [Yama’s] lawyer. Further, we consider that the trial judge erred in proceeding to determine what was otherwise an incompetent motion in the first place. The Supreme Court quashed the default judgements and ordered the cases to proceed to trial. The cases proceeded to trial at the National Court in September 2003, but Peter Yama’s companies proved reluctant to produce any evidence. Notices to produce evidence filed against both Yama Security Services and Ace Guard Security Services (AGDSS) were ignored. Despite several time extensions, the companies failed to provide documents that could prove their claims. The presiding judge, Justice Sakora, noted that the companies failed ‘not once but thrice, the latter two instances followed specific requests for extended time to comply. One cannot help but ask here as to the real purpose of the request for more time to do what is required by law to be done when in the end it is not done’. Further, the judge asserted that ‘whilst it was incumbent upon the plaintiffs [YSSS and AGDSS] to prove to the required standard (civil) due performance of the alleged contracts for services, no discovery had been made of documents relevant to the issue of damages and quantum’. As the companies failed to produce any evidence to support their cases the proceedings were dismissed with Yama’s companies ordered to pay the defendent’s costs. Peter Yama did not give up though, and the case moved on appeal to the Supreme Court. This time Yama faced two new objections, contesting the competency of YSS and AGDSS to even file the appeals. These objections led to serious forgery allegations against Ace Guard Dog Security Services that finally put an end to the claims. Firstly, it was argued by Telikom’s lawyer that Ace Guard Dog Security Services Limited did not exist as a company, and therefore could not file an appeal. The Notice of Appeal was filed by AGDSS on 16 October 2003. However, at that time ‘Ace Guard Dog Security Limited’ was a registered business name only. 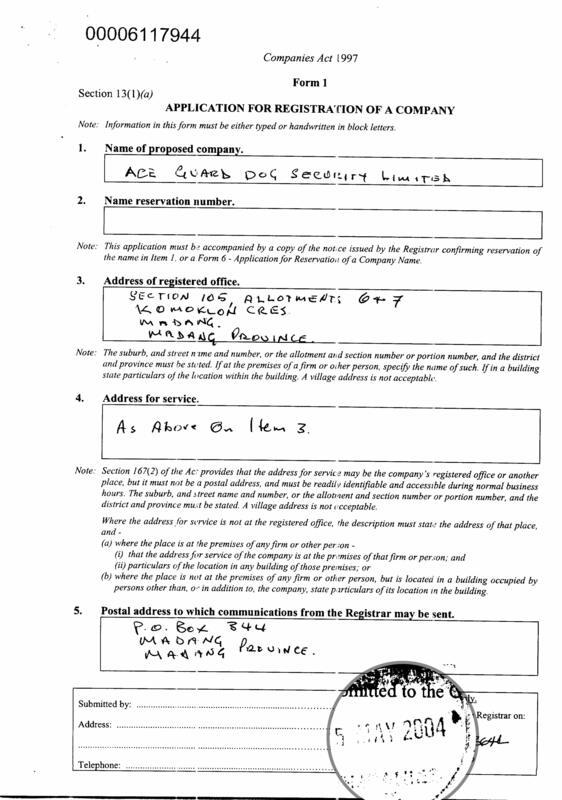 Even that registration, dated 25 October 2002, was well after the security contract had been signed between the parties. To fight this claim, Yama’s company produced a certificate of incorporation, which bore the signature and seal of the Registrar of Companies, and which indicated that the company had been registered in 1998 with the registration number 1-58897. 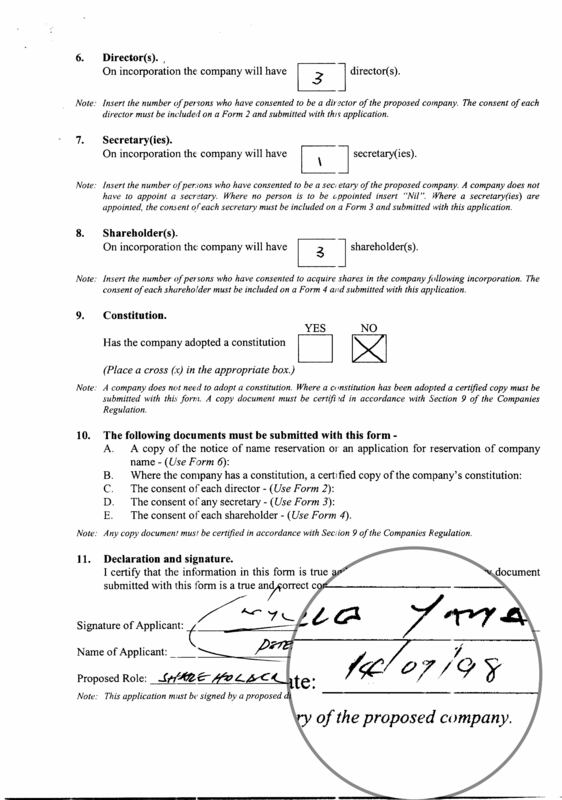 Image: An application to register a local company stamped 2004 by IPA, purports to be signed by Yama in September 1998. The certificate of incorporation was dated 22 November 1998 which is a Sunday. No companies are incorporated on Sundays. Moreover, the computer is closed on weekends for backup. Between Friday 20 November 1998 and the next business day, Monday 23 November 1998, the last company registered and the first one registered on the Monday have consecutive numbers, which at that time were around the 32,000 mark. In six other aspects the document appeared irregular compared to a standard certificate. The document number could not be found and matched with any such numbers in the Office of the Registrar. Following these revelations, the court was satisfied that the document was ‘a forgery’. It was not possible to have a computer printed extract in 1998 because the computer system to print extracts was commissioned only in 1999. The words “current extract” were printed in upper case but genuine documents only have the first letter being a capital. The font used for a heading was different. The words “top ten shareholders” had a spacing in between the words that a genuine document would not have. The extract indicates that 6 files about the company existed, with document numbers that matched actual documents lodged by a company in 2003 that has no relationship with AGDSS. The court ruled that AGDSS was not an incorporated company and thus had no legal standing to proceed with the appeal. In the case of Yama Security Services Limited it was found that at the time of the filing of the appeal, the company was in the hands of a liquidator and the liquidator had not requested the lawyer to engage in an appeal. We should point out our concern over the allegations of forgery in the production of the alleged certificate of incorporation and the extract of records from the Companies office. We consider that there has been an attempt to provide forged documents in order to answer the grounds of incompetence raised by the Respondents. This is a serious matter and we would recommend that the Registrar of Companies consider referring this matter to the police for investigation. PNGi could not locate any court proceedings taken against Yama’s companies or any individuals for the alleged fraudulent production and use of forged documents.